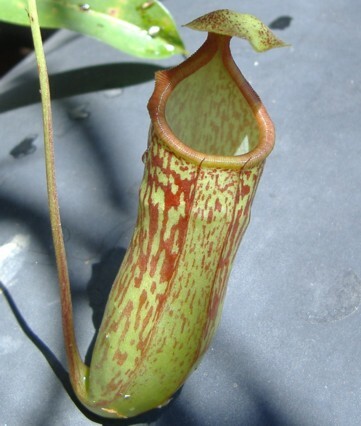 Nepenthes maxima X gymnamphora is hybrid between two highlanders. I purchased this hybrid from Lee's Botanicals in Florida. I think they made this cross themselves but I can't be sure. They have made some other crosses that are available from time to time off of their website. There aren't very many crosses using N. gymnamphora so I decided to pick one up because it seemed a bit unusual. I'm growing it outdoors so I don't have much information yet about this hybrid. It should be relatively easy to cultivate once it settles in. Almost all N. maxima hybrids are easy going and adapt to a multitude of different climates. This isn't a showy hybrid but maybe when it gets larger the pitchers might be more interesting.